The director of the Hoge Veluwe national park wants wolves to be removed from the protected species list so numbers can be controlled, local paper the Gelderlander reports. Van Voorst tot Voorst, a landowner himself, belongs to the European Landowners Organisation in Brussels which is lobbying for the change. The national park director said the Netherlands, which may see two wolves settle permanently in the Veluwe area this year, is too small too house more than a handful of wolves and that the Netherlands lacks the expertise to guide the process. He also said that some of the wolves have been released into the wild by people. ‘They behave in a way that is not natural. They have been spotted here walking along bike paths and roads. I have been to natural parks in Italy and Poland and people who live there have never seen a wolf in their lives. Wolves will not attack people but if it loses its natural shyness it could become dangerous,’ Van Voort tot Voort told the paper. Another argument for the possibility of culling wolves in the Hoge Veluwe is the presence of mouflon sheep which, according to Van Voort tot Voort, would become easy prey for the wolves. ‘Mouflons are essential to the park because they keep the vegetation in check and are very popular with the public,’ the paper quotes him as saying. But sheep owners in general are right to be worried too, he said. The park director says the theory supported by organisation Wolven in Nederland that wolves which have initially attacked sheep will go on to live off wildlife is ‘total nonsense’. 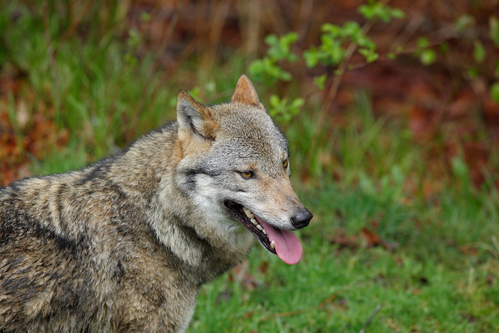 Wolven in Nederland spokesman Roeland Vermeulen told DutchNews.nl that management is key. The return of the wolf in the Netherlands is subject to policies agreed upon by the provincial authorities and in line with European guidelines, he said. ‘As far as sheep are concerned with the right management these can be protected from wolves, for instance by putting them inside for the night, or behing electric fences for part of the time,’ Vermeulen said.